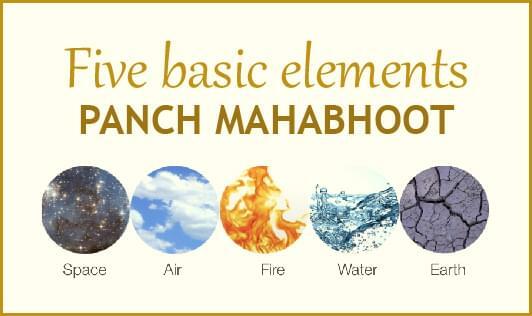 Five basic elements (Panchmahabhoot). Why their balance is important? According to Ayurveda, everything in this universe is made up of five basic elements. These five elements are earth (Prithvi), water (Jal), fire (Agni or tej), air (Vayu) and ether or space (Akash) and together they are termed as Panchmahabhoot. These are the tiniest elements, which constitute living and non-living matters. Everything, including drugs, herbs, and living beings are made of these basic elements. Every matter contains all of these five elements. Imbalance of one or more elements cause’s problems in one’s life and by balancing these elements these problems can be resolved. Earth - Earth is stable, heavy and rigid. Anything Solid is Earth. Earth has the Power to hold or stop. It means stability, durability, and firmness. In our body, the parts such as bones, teeth, cells, and tissue indicate earth element. When hair is falling, teeth are weak, bones become weak, bleeding doesn't stop and the person doesn’t gain weight, Earth element has to be increased to resolve all these problems. But if the weight is excess, the stool is hard, nodes or tumors are formed in the body, it needs to decrease Earth element. It improves strength and stability in the body. Water - The main quality of Water is coldness. Water also helps to lubricate and have sticky properties. Dry skin or burning sensation anywhere in the body can be treated by increasing the Water element. Excess of water in anyplace in the body or organ causes swelling. Excess of water increases the above-stated characteristics in our body and decreases the opposite. Water intake is useful in disease caused by fire element or pitta, Vata or air element. For example acidity, constipation, dryness, skin problem, excessive breakdown or accumulation of toxins. In other words, it works as the best detoxifying agent. Fire - The most essential quality of Fire is Heat which makes the things mature, helps in melting and purification. The fire has the power to change. It can change solid into liquid, and liquid into gas. Balanced Fire can melt the cysts of an ovary, fibroids of the uterus, osteophytes of joints and spine. But if the fire increases it may result in acidity, dark urine with burning sensation, urticarial or skin rash, anger, aggression etc. And if the Fire reduces it causes lack of desire for food, high cholesterol level, diabetes, lack of creativity. Wind - The wind element is unbalanced, cold and dry. There should be a perfect flow of wind in body and life. If the wind increases it may cause twitching of muscles, Parkinson, unsteady mind. And if the wind reduces it may result in no bowel movement, low blood pressure, laziness lack of creative ideas, and life goes at a very low pace. Space - The Space element is non-resistance and it also defines the gap or space between two things. There should be a perfect Space maintained between our Joints, thoughts etc. If due to any reason space decreases between the joints, joints will resist and thus will cause the joints pain. If Space reduces in thoughts, it is even more dangerous and causes anxiety disorder, irritating behavior, insomnia, and violence.